The Old Ghost Ultra trail visible cutting along the gorgeous Lyell Mountains. Photo: Stephen Roberts - Shakey Finger Photography. Thirty thousand feet above the Pacific Ocean, flying eastbound, I reach into my bag for a book and a snack, and I feel something foreign. It takes me a second to place the hard, fist-sized object: a chunk of Granite from the Lyell Mountains of New Zealand’s West Coast. It is mounted on a small wooden platform that reads: 2017 Old Ghost Ultra, Winner – Open Male. A mere 48 hours prior I had been racing across those mountains, blown away by their remote beauty and reflecting on the happenstance that led me there. 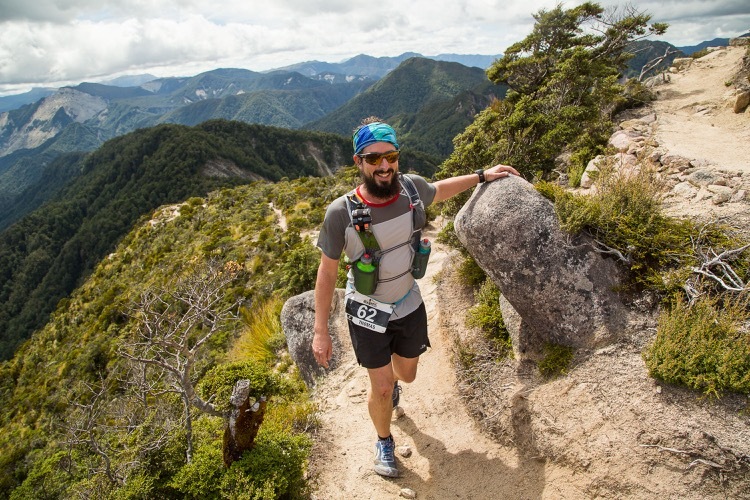 I came to New Zealand in February to race the Tarawera Ultras 102K, a well-established and highly competitive race in Rotorua, on New Zealand’s North Island. But when it takes well over a day to travel somewhere (and seemingly more when you “time travel” across the International Date Line), it only makes sense to stay a while if you can. My partner, Beth, and I planned to take two weeks touring New Zealand’s South Island after Tarawera. We’re not the types of planners who book every minute well in advance, so while we had a loose structure for our south island adventure, we retained plenty of flexibility. 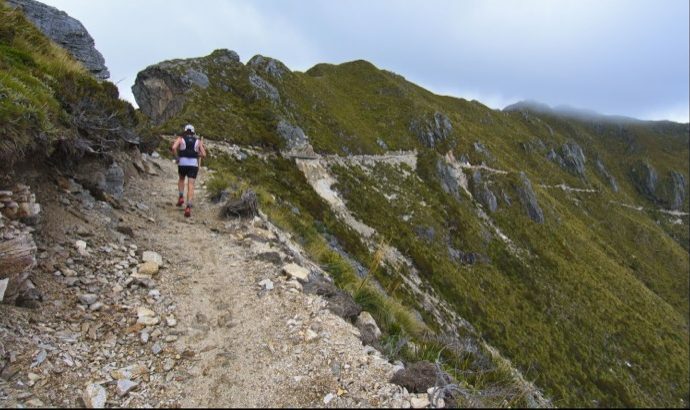 I had begun soliciting South Island advice from the number of ultraunning Kiwis I met in Rotorua: favorite trails, towns, coffee shops, breweries, etc. One recommendation that kept coming up, usually with fervent zeal, was the Old Ghost Ultra. 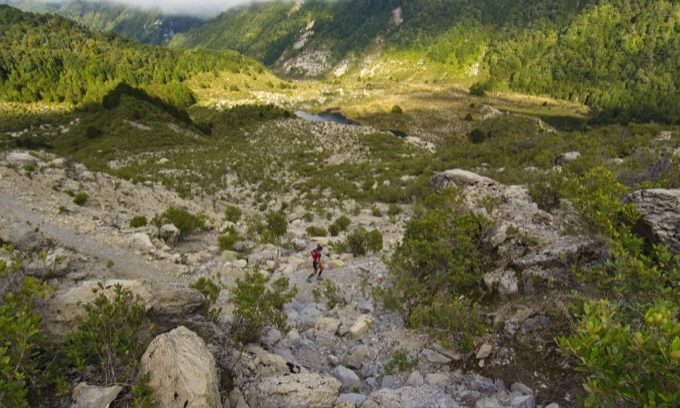 Taking place two weeks after Tarawera, I learned that this is an 85-kilometer, point-to-point race in the remote mountains near Westport, New Zealand. The race’s entire 53 miles are run on a brand new trail called the Old Ghost Road. Its isolation is so complete that from the start to finish, one does not cross a road or another trail. Multiple Kiwis in the know told me this was not to be missed. Most were heading there themselves to race, spectate, or volunteer. And as luck would have it, I had already planned to be roughly in the area at that time. I vacillated for a number of days about the prudence of running the Old Ghost Ultra so soon after Tarawera. However, my recovery from Tarawera seemed to be going well as I tramped around the South Island. Once friends got the ball rolling by putting me in touch with the race organizers, I felt committed. I reasoned: I’ll just run the route if I’m not feeling so good, as opposed to really racing. 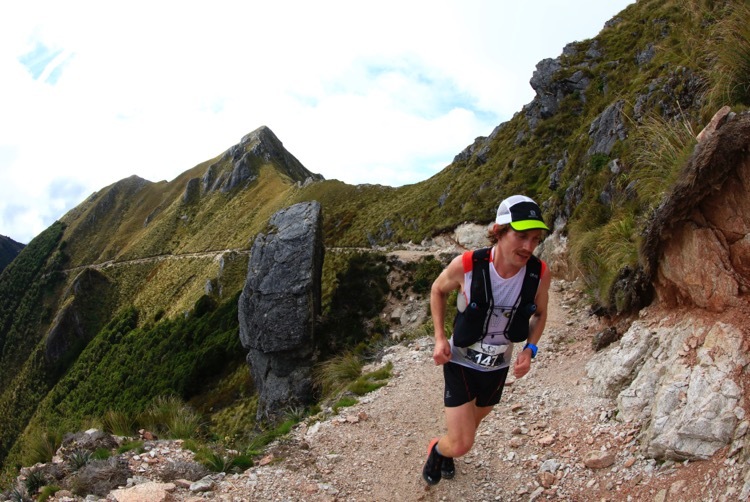 However, a few days later I found out that a top Kiwi ultrarunner, Vajin Armstrong, was running, and that there was a solid winning prize of 1,000 NZD. My competitive instincts started to take over. A proper race seemed likely, whether I was recovered or not. But regardless of racing outcome, I was curious to learn more about this new trail and why everyone was so keen to run it. A runner crosses one of the many cable bridges along the course. Photo: Jase Blair – Katabatic Creative. The Old Ghost Road punches a dog-legged track between the coastal town of Seddonville (a bit north of Westport, also on the coast) and the historic gold mining town of Lyell, in the Buller Gorge. And it is that mining history where the Old Ghost Road’s story begins. The current trail, though completed less than two years ago, actually reaches back 140 years to New Zealand’s 19th-century West Coast gold rush. About ten years ago, a group of West Coasters came across an an original survey map for a road between Lyell and Seddonville, which had been proposed during the gold rush. However, to their best knowledge, no such road existed. Enchanted by the idea, two experienced bushmen, Marion Boatwright and Steve Stack, set out to see if part of the road had ever been built and if any impressions of it remained. After some exploring, they found traces of the old road heading north into the mountains from Lyell. The gold rushers of the late 19th century had started the road, but were ultimately turned back by a gold rush gone bust and the sheer difficulty of the undertaking. Boatwright and Stack decided to try to follow the original planned road to its conclusion. After six days of tramping across the mountains and through the bush, they emerged on the coastal end of the original planned road at the mouth of the Mokihinui River. Sharing their discovery with a handful of local outdoor enthusiasts, including Phil Rossiter, the group of friends formed the Mokihinui-Lyell Backcountry Trust. With permission from the Department of Conservation, they began the audacious undertaking of trying to build and complete the historic Old Ghost Road as a trail. Rossiter is the current chairman of the trust and also the race director of the Old Ghost Ultra. With small donations and a crew of volunteers, the group began work on the track, originally envisioning it as a tramping or hiking route. Progress was slow at first, as the core team realized what their forebears had learned over a century before. 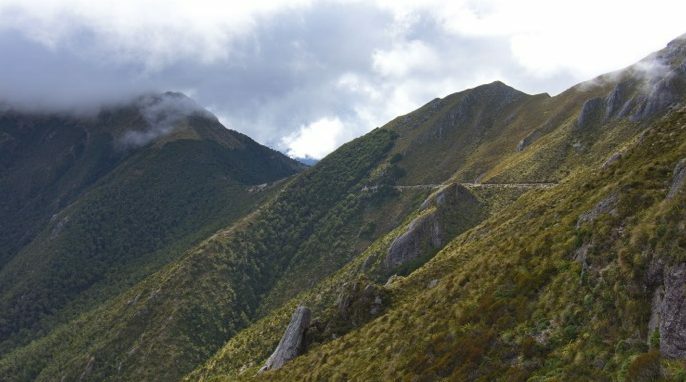 Designing and building a mountain track through native New Zealand bush is no small task. The Old Ghost Ultra trail visible cutting along the gorgeous Lyell Mountains. Photo: Stephen Roberts – Shakey Finger Photography. The work on the road was also taking place in the midst of the recent global recession, drawing another parallel between the modern and original builders: one of scarce financial resources. But while the financial hardships of the gold bust ultimately led to the abandonment of the original project in the late 1800s, the global recession actually yielded a silver lining for the modern team. 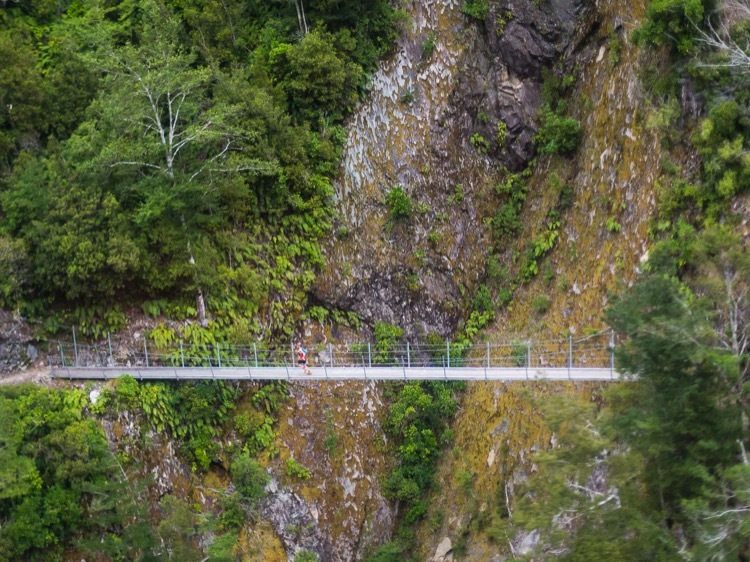 In order to boost employment and help stimulate the tourism economy, the New Zealand government, in partnership with New Zealand Cycle Trail, was soliciting bids for construction of a number of Great Rides to match the country’s famed Great Walk tramping routes. Seizing the opportunity, the Old Ghost team slightly altered their original plan by reconceiving the track as a joint hiking and mountain biking trail. With nothing to lose and much to gain, they submitted a bid. To their surprise, the bid was accepted, and the stakes of the project rapidly increased along with its funding. In a documentary about the building of the trail, called Muscle and Dreams, Rossiter says, “It was the tipping point. We’d [been]hopeless dreamers… and this just took us to the stratospheric level of a big-time project.” The change helped the team finetune its processes, increasing man hours and access by building backcountry huts to house the track builders. The team had begun construction from both ends of the route, following the historic survey map. But on the leg heading north from Lyell, they reached an impasse at the same place the original builders had turned around. The terrain proved nonnegotiable, and only with a creative aberration from the original plan was the team able to move forward. Instead of descending to the south fork of the Mokihinui River, the new route veered sharply up from the Lyell Saddle, rising out of the bush and up to the ridgeline tops of the Lyell Range to the east. As Boatwright put it, “Getting out of the bush and getting onto those tops changed everything.” To the great benefit of those who now use the trail, this section is the most visually striking, affording views of virginal wilderness in every direction. A runner enjoys the view above bush at the Old Ghost Ultra. Photo: Jase Blair – Katabatic Creative. In late October of 2015, the team finally managed to join the southeast and northwest sections of the trail. Marveling at what the group accomplished, Boatwright says of the trail, “It’s a work of art, a gift to the Universe.” After a roughly six million dollar investment, 110,000 construction hours, and over 25,000 volunteer hours, the Old Ghost Road had been completed. Flaherty charging along the course’s most picturesque stretch. Photo: Richard Rossiter. Pieces of this history had been leaked to me from others as the race approached. While I didn’t have a full appreciation for the work and history behind the trail when I first arrived in Westport, the community surrounding the trail and race was immediately apparent. Rossiter, the race director, warmly greeted and chatted with racers prior to the pre-race briefing. The room was full of excitement—returning racers happy for another opportunity to run the route and first timers giddy to see what it held in store. The race is relatively small with a homey feel (136 runners finished the race this year), but it is also highly organized and professional. The trail’s remoteness demands this attention and professionalism. 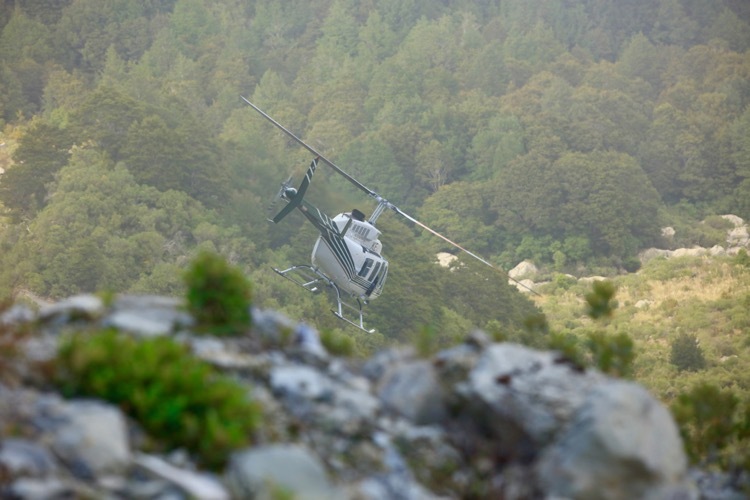 With the only access to the trail coming via helicopter, the stakes if someone contracts a serious injury during the race are much higher than most races. Reflecting this, every racer is required to carry a GPS spot tracker as well as a fairly robust mandatory kit: thermal pants and long sleeves, waterproof pants and jacket, first aid kit, emergency blanket, etc. One gets the sense that Rossiter’s calmness and relaxed sociability stems from the fact that he has everything dialed—that the systems and team he has put in place can handle whatever adverse circumstances arise. On race morning, most racers are bussed from Westport to the starting line in Seddonville. A few camped near the start. An hour before dawn, the few hundred of us mingled and shook off nervous energy. With little fanfare, Rossiter called us to the line and released us into the wilderness, up the canyon of the Mokihinui River. My main competition, Vajin Armstrong, tried to capitalize on my relative tiredness from Tarawera, shooting up the track and disappearing within minutes. I had assumed that we would share the early miles, but it seemed I would be running this race alone. 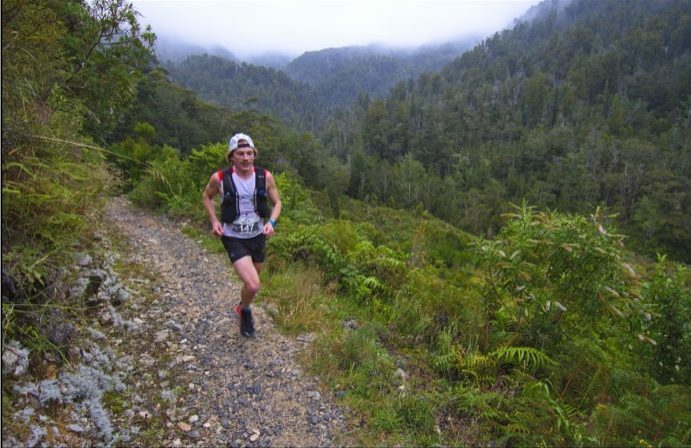 Matt Flaherty logs early miles in the Mokihinui River valley. Photo: Stephen Roberts – Shakey Finger Photography. Winding up the Mokihinui, the river’s rapids and the beautiful bends of the canyon gradually came into focus with the day’s first light. Ten miles in, I arrived at the first aid station, where I was able to refill a bottle and eat a bit of fruit. Armstrong was already several minutes ahead. Owing to the trail’s remoteness, there were only four aid stations in total on the route, and unless one was carrying quite a lot of water, it was necessary to refill a few times at muntain streams. Working my way into the race’s middle miles through temperate rainforest, I stopped for a refill. I wasn’t feeling particularly peppy, so I just focued on my effort and tried to keep plugging along at a sustainable level. I wouldn’t encounter the second aid station until mile 26, where drop bags, lifted in by helicopter, awaited runners. Drop bags were lifted in by helicopter to the race’s mid-point. Photo: Richard Rossiter. First, I had to negotiate a significant climb through the Boneyard, an eerie slope with no trees and huge boulders strewn about—the handiwork of a recent earthquake. Since the track is a mountain bike route as well as a hiking route, everything is at a completely runnable grade. The climb switchbacked endlessly until cresting the ridge. A similar descent on the opposite side took me past a small, picturesque lake, as helicopters flew low overhead. I knew that the second aid station must be close. A mile later, I came into the station, where several volunteers, including my new Kiwi friend Grant Guise, were waiting. Armstrong had seven minutes on me, they reported. I took a minute or two to change bottles and refuel from my drop bag. Seven minutes felt like a lot of time for 26 miles. It seemed likely to me that I’d be settling for second place today. A runner descends a rocky slope shortly before the mile 26 aid station. Photo: Shakey Finger Photography. Most of the course’s 8,500 feet of gain come in the second half of the race. Shortly after midway, runners climb well over 3,000 feet. Leaving the aid station, I struggled through this ascent. Capped with a long flight of steep stairs, it finally emerged above treeline to stunning, 360-degree views. The trail’s next 10 miles are its most stunning and the scenery buoyed my spirit. Traversing a ridgeline and then dropping down to connect to another, I kept looking ahead to see if I could spot Armstrong, but no luck. A short grunt of a climb around mile 34 delivered me to the third aid station at Ghost Lake Hut. The hut is dramatically perched on a cliffside, and I couldn’t help but think how great this route would be to hike, taking ones time and staying in the backcountry along the way. As I came into the aid, Phil Rossiter let me know that Armstrong was only four minutues ahead. This gave me a glimmer of hope. I quickly downed some Coke and headed out, mentally in pursuit for the first time. As I traversed along a western-facing slope, just below the ridge top, I finally spotted Armstrong ahead. It would be a while before I caught him, but the hunt was on. Several miles later, once we had dropped back below treeline, I gradually caught him and tucked in on a long, switchbacking descent through the forest. We chatted for several minutes while I recharged. But with less than 12 miles remaining, I decided it was time to press my advantage. I passed him and pushed hard down the mountain, quads and feet aching. Flaherty giving chase to Vajin Armstrong in the course’s back half. Photo: Stephen Roberts – Shakey Finger Photography. Several minutes later, I arrived at the final aid station at the Lyell Saddle hut near mile 42. The two volunteers said that they were expecting someone else. This was Armstrong’s home turf, and they had likely heard via radio that he had been leading earlier. I refilled my bottles as quickly as I could and then bolted down the trail, now running scared, roles reversed. The entire Old Ghost Road is marked every kilometer with signposts. As I headed towards the finish, I was counting them down, passing each in roughly four minutes. This final stretch is primarily a descent, which aided my speed, but my quads were rebelling. It was a long way to push so hard, but I knew Armstrong couldn’t be far behind. Finally, I was rolling through the final kilometer to the mercy of the finish line. I managed to finish in 6:52:45, about an hour faster than the record set the previous year (by Kiwi Ruby Muir, who impressively tied for the outright win in 2016). Four minutes later, Armstrong crossed the line. Rossiter was waiting for us, excited that a proper race had unfolded on the trail he loves so much. Such competition often leads to faster times, and it had allowed us to break seven hours, a mark the possibility of which Rossiter and others had been debating. Finish line beers and barbeque followed, while we watched and cheered other runners coming in. 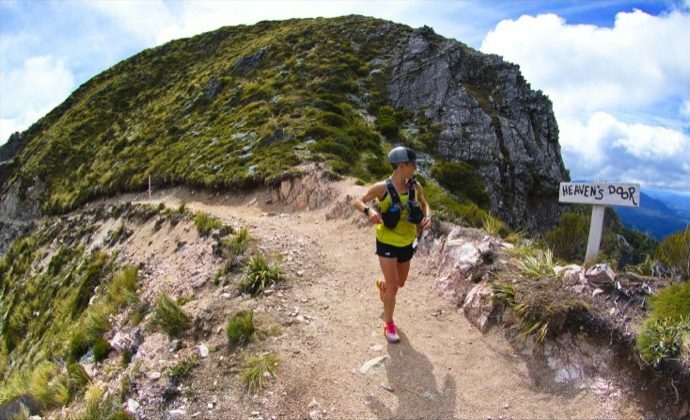 Mel Aitken, a police officer from nearby Greymouth, topped the women’s field in 8:24:09. Eventually, New Zealand’s notorious sandflies started to get the better of us, so we headed back to Westport and a place called the Star Tavern for some of the best fish and chips I’ve ever had. Women’s winner Mel Aitken takes a moment to appreciate the breathtaking view through “Heaven’s Door.” Photo: Stephen Roberts – Shakey Finger Photography. The awards for the race took place the next morning in Westport, and it seemed the vast majority of competitors had stuck around. It was a great way to end the event and give the runners in each category his or her proper due. After a hearty thank you to Rossiter and his excellent staff (along with a coffee and pastry with our new friends), Beth and I headed down the coast, up and over Arthur’s Pass to Christchurch. The next morning we would board a plane home, leaving our ghosts on the trail, like so many before us.